I’ve always been fascinated by how wars have affected my home town, Washington, D.C. This trend was particularly noticeable during World War II and continues today with America’s wars on terror in Afghanistan and Iraq, particularly in the city’s Northern Virginia suburbs (where all branches of the military have major bases). But, the Civil War was the first example of war dramatically expanding the population and economy of the nation’s capital. 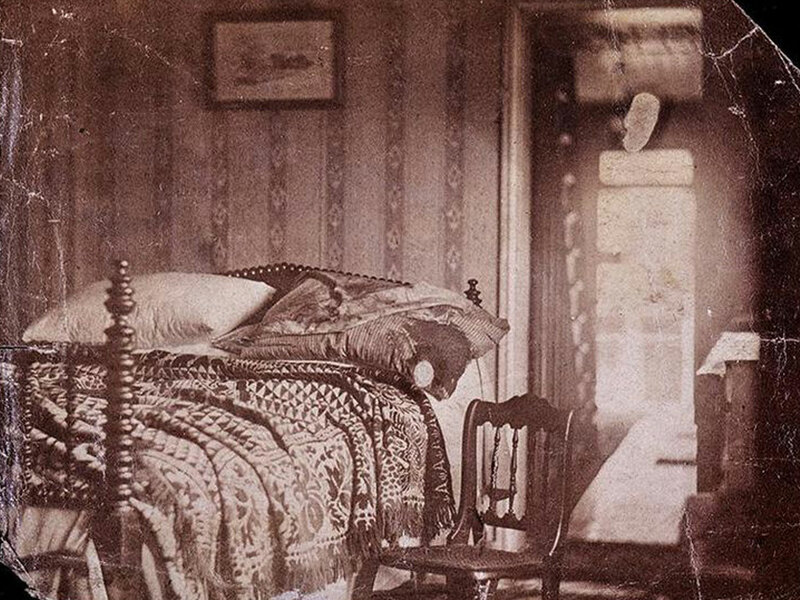 Photo of the Lincoln death room in 1865. Photo courtesy of the Meserve-Kunhardt Foundation. While the Petersen House is best known as the place of Abraham Lincoln’s death, a closer look inside reveals a good view into Washington during the Civil War. The known occupants of the house at the time of Lincoln’s death all made a living from Washington City’s thriving war-time economy. When Lincoln stepped off the train in Washington in 1861 to assume the presidency, the city he entered was a small, dirty, unfinished, southern town of 62,000 people. There were no paved roads and only a handful of federal buildings, including the Capitol with its unfinished dome. Goats, pigs and cows roamed the streets. Sanitation was lacking and disease was prevalent. When I give interpretive tours to local students we start in front of the theatre and compare what 10th Street looked like in the 1860s to what it looks like today. 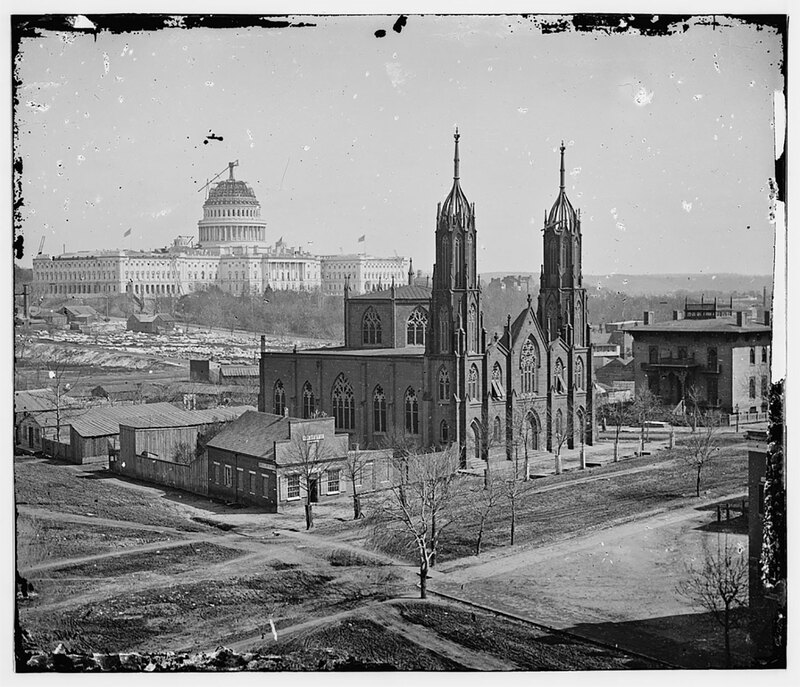 The unfinished dome of the Capitol Building in 1862. Library of Congress, LC-BH823- 1. By 1865, when the assassinated president was placed on the funeral train that would carry him back to Springfield, the population in the nation’s capital had tripled. During the war, tens of thousands of people moved into the city. This huge influx included three main groups of people: soldiers; African Americans fleeing slavery; and people employed by the needs of the thriving city. Thousands of soldiers staffed 68 forts that were quickly built to guard the city. Many more recovered from wounds and disease in makeshift hospitals around Washington. As the Union Army pushed south, large numbers of people fleeing slavery moved to Washington for the protection the city and forts offered. William and Anna Petersen’s boarding house was in the thick of the action. Located directly across the street from Ford’s Theatre on 10th Street and one block off Pennsylvania Avenue, the house was walking distance to all of the city’s federal buildings. It was also surrounded by the dozens of restaurants, saloons, shops, theatres and houses of ill repute that were feeding and entertaining the city’s exploding population. 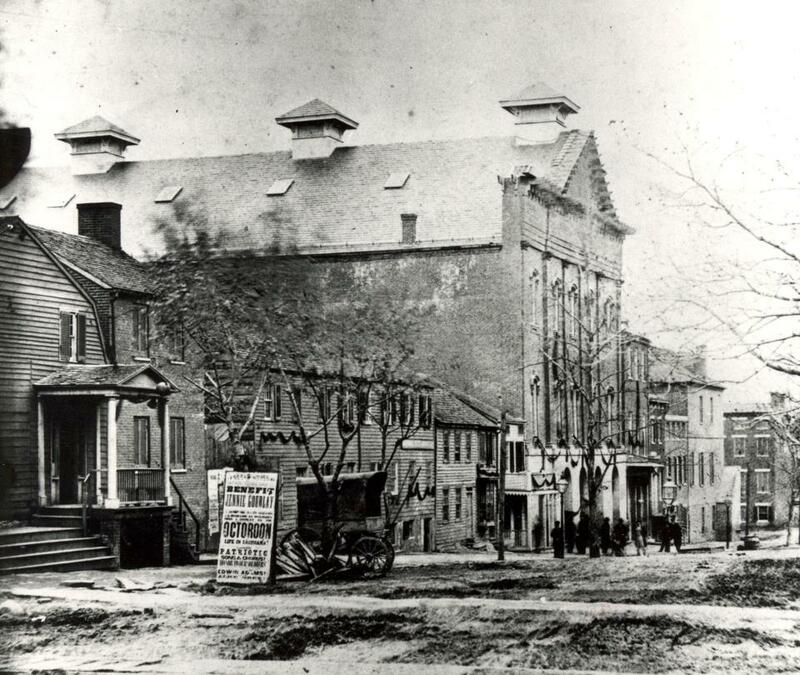 This July 1865 photo shows Ford's Theatre, still draped in mourning. Though a street advertisement for the play "An Octoroon" is present in the photo, the show did not go on as the producers received threats to close the building. Photo courtesy National Park Service. Immediately after Lincoln was shot in Ford’s Theatre on April 14, 1865, he was carried across the street and placed in the small bedroom at the back of the first floor of the Petersen’s house. The renter of that room was Willie Clark, a 23-year-old clerk in the army’s Quartermaster Department. Much of the material used to equip, arm and feed the United States Army was stored in Washington. 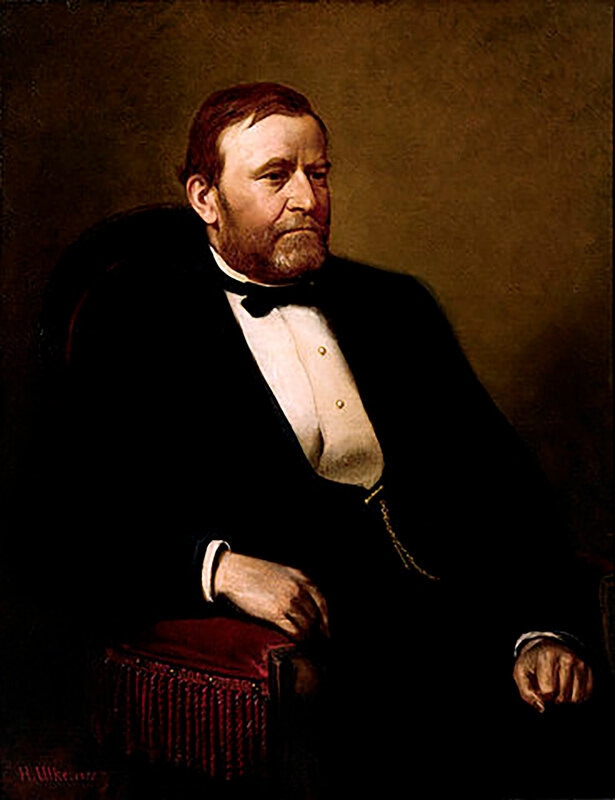 Portrait of Ulysses S. Grant by Henry Ulke, 1874. Photo courtesy of the White House Historical Association. The other two known boarders at the Petersen House on the night of Lincoln’s assassination were Julius and Henry Ulke. The German-born Ulke brothers operated a portrait studio on Pennsylvania Avenue. Julius specialized in the relatively new medium of photography, while Henry painted portraits. It was Julius who took the iconic photograph of the death room shortly after Lincoln’s body had been removed from the Petersen House. Henry painted many prominent portraits of military and political figures including a portrait of Ulysses S. Grant that hangs in the White House today. A look at the occupations of the Petersen House boarders offers insight into the thriving war-time economy in Washington during the Civil War. Since then, wars continue to have impact on the economy and population of Washington, D.C. To experience the growth of the Northern Virginia suburbs, since the start of the wars in Iraq and Afghanistan, all you have to do is take a drive on I-395 during rush hour! Jake Flack is Ford’s Associate Director of Museum Education.